Another day, another pulse of warm, wet, and windy. We have two distinct problems at different elevation levels. Down low the rain and warm temperatures are destabilizing the snow by reducing the strength of the snowpack. Up high we continue to get snow and our more common types of avalanche problems. These elevational differences are distinct, but equally dangerous to the backcountry traveler. With ongoing active weather the danger rating will be CONSIDERABLE at all elevations again today. Large, full depth avalanches are still being reported in our region. Terrain steeper than 35 degrees should be avoided. The first avalanche problem that you will encounter from the trailhead is wet snow. The freezing line is reaching up to 2000 feet or higher. Water saturated snow is heavy and weaker than drier snow. 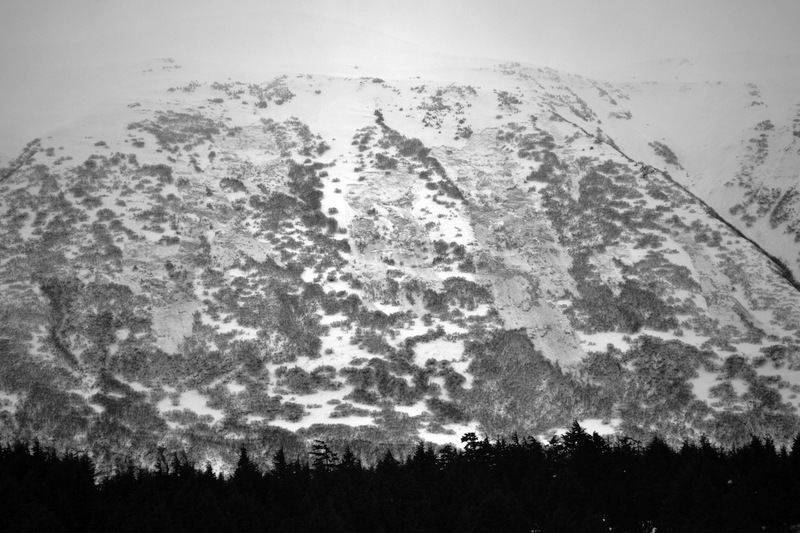 This problem will be found below treeline, in terrain often considered "safer" from avalanche danger. Read more about Wet Slab Avalanches here. Photo from January 21st showing low elevation terrain and several natural avalanches on Seattle ridge. Photo by Katie Johnston. Above treeline we are accumulating significant snowfall through this warm storm cycle. The weak layers at or near the ground are now buried fairly deep (4-6 feet) and continue to be a problem for large and dangerous avalanches. While we continue to have warm temperatures and snowfall, any steep terrain that could produce a dry deep slab avalanche should be avoided. We have many reports from the last 2 weeks of remotely triggered and natural avalanches on these old weak layers. The frequency of these events is decreasing, but the size is increasing as the snowpack builds. Above 2000 feet we will be getting more snow today. The National Weather Service is predicting up to a foot of new snow at higher elevations. With ongoing snowfall we need to wary of unstable storm snow in the top layers of the snowpack. This will be more pronounced in areas of stiff wind slab. In the last 24 hours we received roughly 0.5 inch SWE (5 inches snow) at Turnagain Pass and over 1.5 inches SWE (15 inches snow estimate) at Alyeska. Wind was strong yesterday morning, with gusts into the 90s mph, but tapered down to the 30s and 40s for much of yesterday. Temperatures are consistently warm, in the 40s F at sea level and only reaching freezing (32 F) near 2500 feet elevation. Today, we have another pulse of moisture headed our way. Roughly an inch of water is expected today, with another 1/2 inch tonight. Snow line will be near 2000 feet. Wind is from the southeast from 52-65mph. This pattern is expected to continue the rest of the week until Saturday when the first break in the weather appears in the forecast.